“He wanted ppl to know regardless of his unjust situation, he’s in good spirits & humbled by the support the people have shown him,” Kaepernick wrote on Twitter. Colin Kaepernick took to Twitter on Monday to tell his followers that he had spoken to Meek Mill in prison. "Spoke to Meek Mill & he wanted ppl to know regardless of his unjust situation, he’s in good spirits & humbled by the support the people have shown him," Kaepernick wrote. "We'll continue to fight against the harsh sentencing practices that have affected Meek & millions of other POC for generations." Kaepernick offered support for Meek following his sentence of two to four years for probation violations, posting a picture of the rapper to his Instagram and writing about the "injustice' of his sentence. The Philadelphia rapper filed an official appeal of his sentence last week and his legal team is petitioning to have Judge Genece Brinkley removed from the case due to a number of accusations of misconduct. 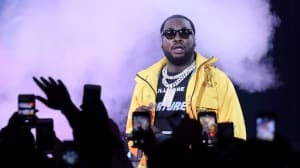 On Saturday, it was reported that Meek Mill had been removed from solitary confinement and moved to a correctional facility in Chester, Pennsylvania. A motion for a bail hearing for the rapper while his appeal case moves forward is still pending approval. Thumbnail image: Mario Kristian for The FADER and Scott Cunningham / Getty Images.